In high school, my drama club had an odd little exercise we used to help practice lines and tweak our on-stage timing. We would recite our lines as fast as we could while the next actor to speak would say the first word of the next line concurrently with the last word of the last line. This exercise was an effective tool, but I couldn’t imagine anyone wanting to pay good money to see an entire play performed this way. 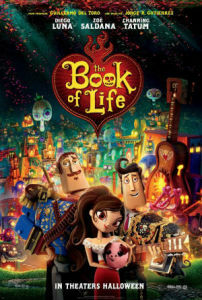 However, curious masochists would merely need to watch Jorge Gutierrez’s The Book of Life to simulate the experience. Here is a film that feels like it is perpetually being fast-forwarded, terrified that if it lingers on a shot or on a line for more than a few milliseconds that its audience will lose interest. There isn’t a moment of quiet or contemplation anywhere. The majority of shots seem to have the first and last few seconds chopped off. What’s left is a story that feels both rushed and too long and a film that seems almost ashamed of its awe-inspiring animation. The film takes place in the realm of myth, where gods and goddesses make wagers over human souls, the dead creep over to the world of the living on the Day of the Dead, and Channing Tatum can play a Mexican. It focuses on a bet between two rulers of the dead, La Muerte and Xibalba, over a love triangle between Manolo (Diego Luna), heir to a family of bullfighters who wants to be a musician, Joaquín (the aforementioned Mr. Tatum), a soldier who has become a hero fighting local bandits, and María (Zoe Saldana), the beautiful, kind, and willful object of their affections. But Xibalba cheats and kills Manolo, sending him to the Land of the Rememered where he must join forces with the spirits of his ancestors to return to life, rescue his town from an army of bandits, and win María’s hand in marriage. 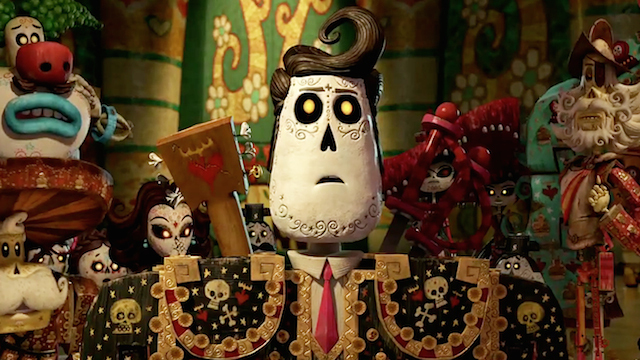 The art in The Book of Life is achingly beautiful and represents the first truly original animation aesthetic to come out of a major American studio since perhaps the grotesque claymation of The Nightmare Before Christmas (1993) and the advent of practical computer animation in Toy Story (1995). Heavily influenced by Mexican art and iconography, the film stands as a mesmerizing blend of folk traditions such as cartonería, wooden miniatures, and ceramics by way of Albert Hofmann. Many of the character designs embrace that most feared and blasphemous of attributes: asymmetry. But the film rarely gives the audience a chance to admire the art. I could use that old stand-by of film critics and claim that the film would be more entertaining if you turned the sound off. But even in complete silence the frantic pacing would be exhausting. The less said about the film’s habit of using pop culture references, the better. Snatches of music from Ennio Morricone and Georges Bizet are welcomed blessings. But Rod Stewart, Elvis Presley, and RADIOHEAD? Not so much. Next ArticleMusic News: Taylor Swift Releases New Single, "Out of the Woods"